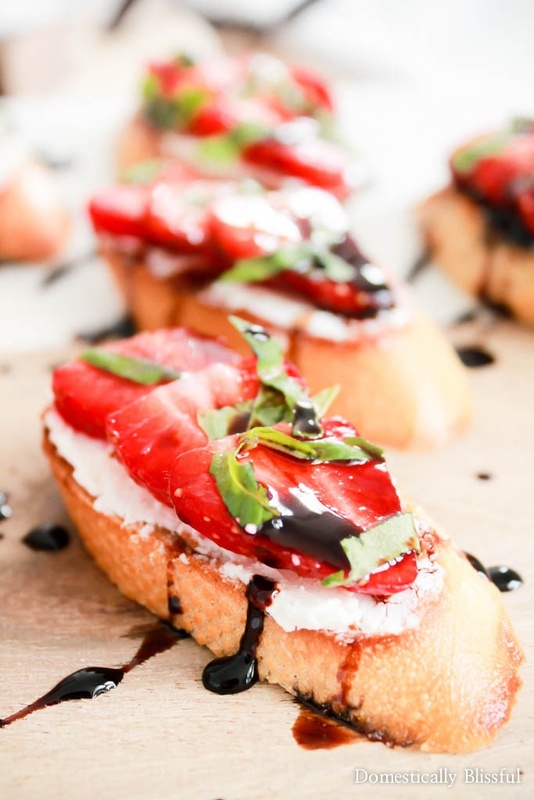 Fresh Strawberry Goat Cheese Crostini with balsamic reduction is the perfect summer appetizer for any party! We are almost done renovating our kitchen! It has been such a long process… Almost 10 months! When we moved in at the end of July last year we had planned on holding off on the renovation process until we had saved up some more money. But then our stove stopped working, on its third use while warming up pizza at a party. So long story short we gutted the entire place, ripped out the pantry, & reconfigured the entire kitchen. By Thanksgiving, the floors were done, by Christmas we had all of our new appliances & almost all of the cabinets were installed, just in time for our 20+ person family Christmas party. A few of weekends ago we finally installed the backsplash & now all that is left is to install the chrome range hood over our stove in our all white kitchen. At the end of last summer & fall, I took a lot of my food photos over at my parent’s house. All winter I have eagerly waited for summer sunlight to photograph lots of new recipes because the cold winter sunlight was short & too often covered by clouds. However, what I didn’t realize was that there was only going to be a short window of good sunlight in our kitchen this spring. As soon as the trees became full of leaves my kitchen instantly became dark again. Don’t get me wrong, I love my kitchen, & it actually isn’t really dark, but for food photography, it feels pretty dark. Which means more often than not I am leaving my beautiful white marble counters, chosen purposefully for my blog, to take photos on a folding table in our living room. I can’t even photograph on the beautiful dark stained table my husband built us last summer because it’s in an even lesser lighted room. How in the world did I not realize all of this sooner? Haha, oh well. As my father says, live & learn! At least now we know more of what we are looking for in regards to house plans. And yes, we are renovating our home while dreaming of building another one. It’s good to dream big! 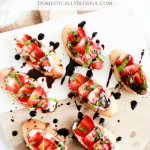 These little strawberry crostini’s appear fancy, but they were super easy to create & are covered in fresh complementary flavors. 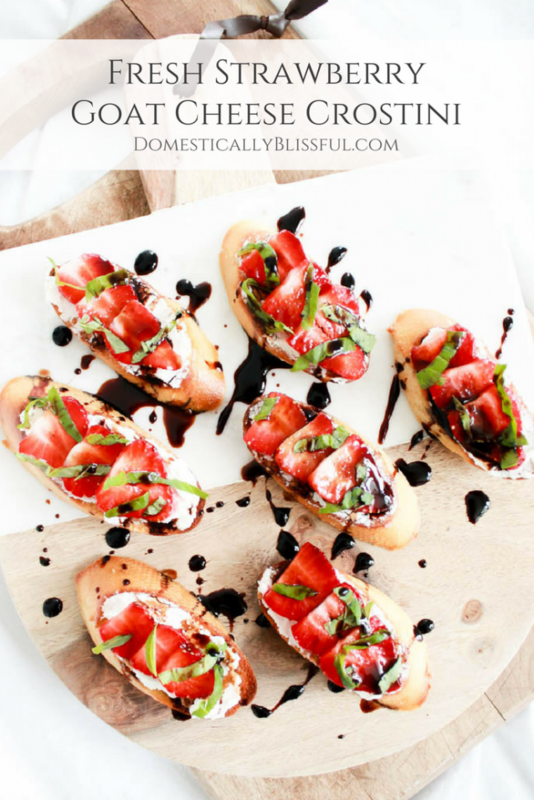 They would be perfect as a little appetizer for a small gathering, a bridal shower, or even a fancy bbq outside. This is the 4th strawberry recipe I’ve shared this spring which means I am now officially going to switch over to other summer flavors. But to recap, this year I have made Strawberry Caprese Pasta Salad, Strawberry Banana Bread, & Strawberries & Cream Popsicles. And technically this Carrot Patch Cake isn’t a strawberry recipe, but it’s topped with strawberries! And in case that isn’t enough strawberry recipes, because I know how much you love strawberries, here are a few of my favorites that I have shared over the last few years: Strawberry Fruit Leathers, Easy Strawberry Sweet Rolls, Fresh Strawberry Vanilla Milkshake, & Dark Chocolate Strawberry Scones with Strawberry Drizzle. 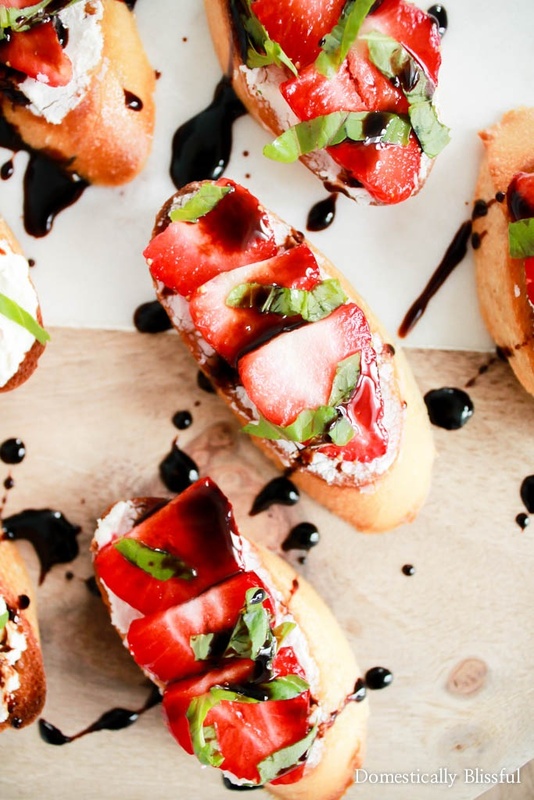 These crostini sound and look delicious! pinned for later. This looks so yummy! What a gorgeous appetizer. This looks so good! 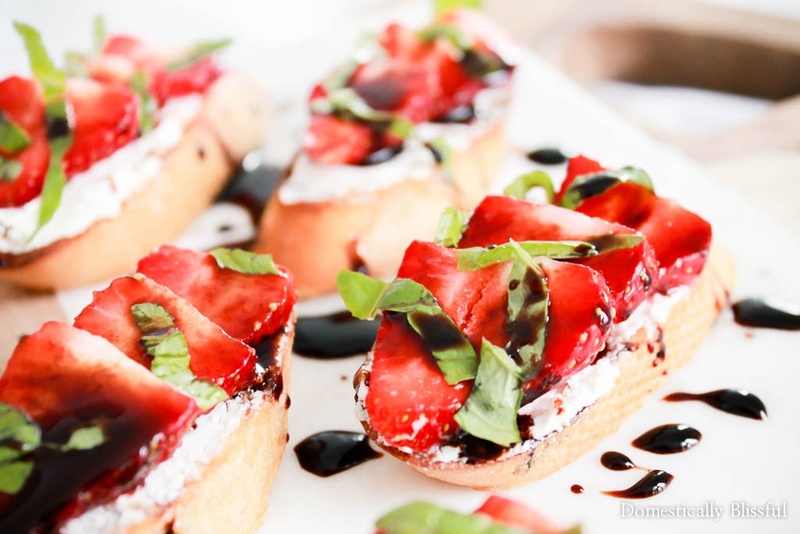 It’s the perfect crustini for a tea party or summer bridal shower! These looks so delicious, perfect for my upcoming party that I am going this coming July. Thank you for sharing this recipe. I am hungry just looking at it. I hope you get a chance to make them for your July party! OMG, This looks absolutely delicious! Such a healthy and tasty Snack! Thanks for sharing! This looks super delicious! I will have to try it out! Thanks!! 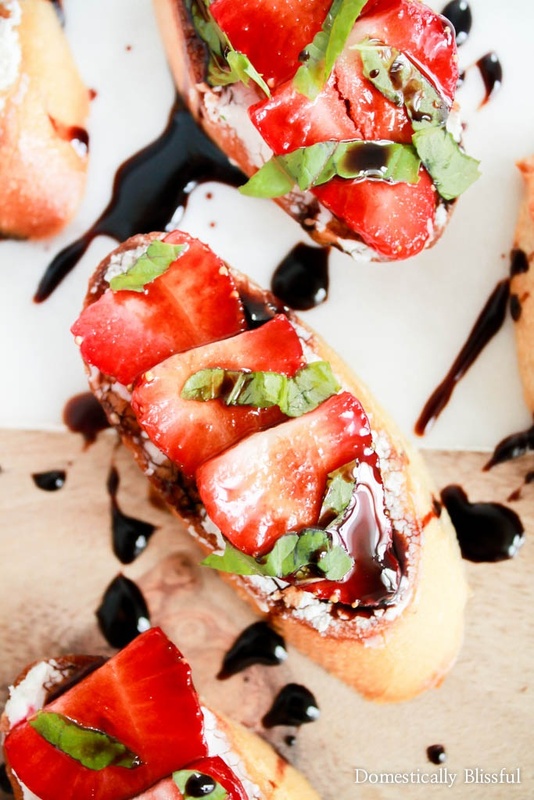 BALSAMIC reduction on anything is amazing! my mouth is watering right now. I JUST DID A RECIPE AND have some strawberries left over, i can’t wait to try this! Oh my word, these look amazing! Such a great summer dish as well–most of the ingredients are at farmers markets this time of year! Thanks, Lona! So true! I need to stop by the little stand near my parent’s house, they have the cheapest & most delicious deals on zucchini & corn. 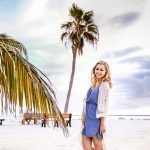 This recipe sounds SO good, and your photos are absolutely stunning! I have the same problem as you with my kitchen – we did a full renovation, but the final result was pretty dark. The original room had a weird window into another room that my husband was dying to patch up, and I wanted to compensate for the loss of light by knocking down a wall, which of course turned out to be load-bearing! Kitchen renovations are the worst, but I’m glad yours is finally done! They make it look so quick & easy on tv, but it is anything but that. Every project seems to take 3 times as long to complete as we think it will (even the small ones) & costs almost twice as much. YIKES! Even still, it’s nice to no longer have an 80’s kitchen! Yum! Now I’m craving goat cheese, strawberries, & crackers!! Okay this might be my favorite of your recipes yet! 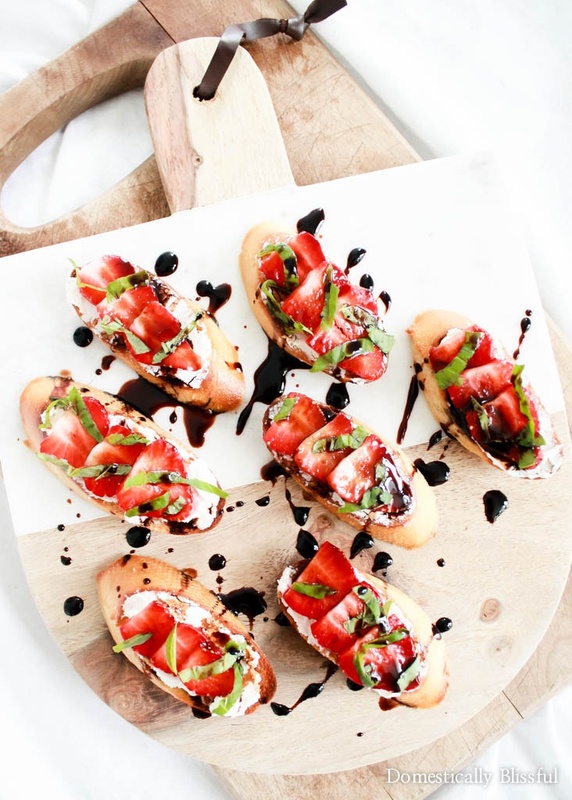 I love everything abotu this goat cheese and balsamic might be my favorite foods ever! We hope to go strawberry picking in the next few weeks!